Percy Jackson breathes new life into familiar Greek myths and introduces several less-popular men and women. You’ve got Hercules and Theseus, of course, but also Phaethon, Orpheus, and Bellerophon. Most importantly (to my interests), Riordan tells the stories of four heroines! The ancient Greeks weren’t huge on female inspiration, and I appreciate Riordan’s intentionality in choosing to include Psyche, Otrera, Atalanta, and Cyrene. Female travelers of the world will love this compilation of travel essays from 28 women headed into hilarious, dangerous, and awkward situations all over the world. Although some of the essays are generic travel stories, most are distinctly female, and it made me aware of how infrequently I read about women adventurers. There are stories about accepting imperfect bodies simply by being on a beach overseas, and horror stories of period catastrophes, and a lot of unironic adoration of being female. Mindy’s second book is even better than her first! Why Not Me? is less a memoir and more a series of essays about her life right now. I’m happy to learn about her past, but I’ll be honest – I’m more interested in her life as a 30-something professional woman stumbling through love and work and being a role model. And those topics are made infinitely better because of her hilarious sense of humor. 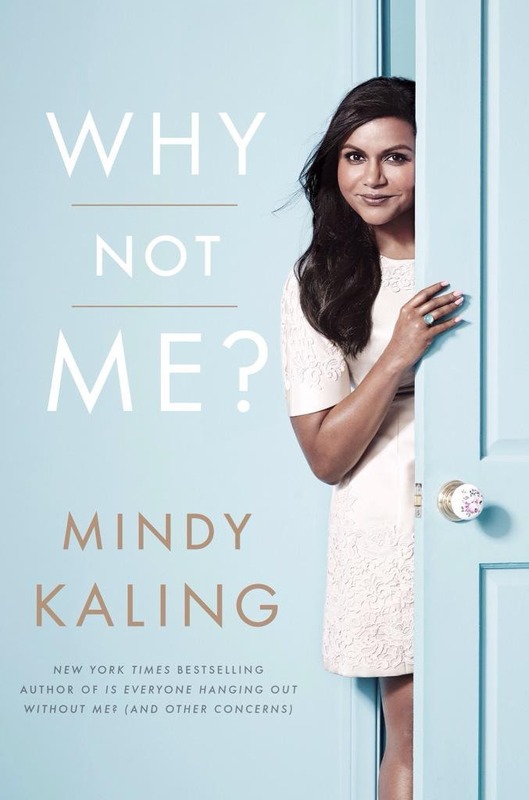 What I love most about Mindy is that she’s honest – she doesn’t try to downplay the perks of being famous (in fact, she revels in them), but she also freely owns up to its downsides. It is so refreshing to read about how to be beautiful: fake hair, spray tans, tailored clothing, technological gadgets, bra tricks, good lighting, facial masks, and knowing how to pose for pictures with your arms akimbo. No nonsense about eating right and glowing skin. Hollywood beauty is all about hard work, and Mindy does wonders for boosting people’s body images by getting honest. I loved this book far more than I anticipated. I like memoirs written by comedians, so I knew I would pick up Aziz’s when it came out. I love him in Parks & Recreation, and his stand up on Netflix is some of the smartest, most modern, most feminist comedy I’ve seen. I knew his book would be funny. I did not expect it to be so smart! He’s an insightful guy, but teamed up with Eric Klinenberg, sociologist, this book is everything my humor-loving sociology-major heart could want. I found it fascinating to look back at courtships of yesteryear (aka 30 or 40 years ago) and compare them to my struggles as a single with an iPhone. So much has changed with the advent of the Internet and phone apps that allow us to check out singles all over the world. In an especially effective analogy, Ansari likens dating to a hallway. Men and women used to enter a hallway with four or five doorways–they peeked through a couple, found one that wasn’t too horrible, and walked through. Now, singles stand in a hallway with millions of doorways. This enormity of options means that we are more likely to find someone who aligns closely with our interests, values, and personality. But it also means that we are often paralyzed, terrified to walk through any doorway for fear that the next one down will be better. Ansari hilariously describes and analyzes the frustrations of modern dating. I appreciated his honest assessment of the good and the bad, and I really appreciated how he managed to find humor in it all. I finished the book both thankful and horrified to be in the dating world at this time in world history. But at least now I have the tools to understand what I’m going through and hopefully wade through the complications a little more effectively. At some point, every one of us embarks on a journey to find love. We meet people, date, get into and out of relationships, all with the hope of finding someone with whom we share a deep connection. This seems standard now, but it’s wildly different from what people did even just decades ago. Single people today have more romantic options than at any point in human history. With technology, our ability to connect with and sort through these options is staggering. Just a few years ago, in 2010, 10% of single Americans said they met their significant other online. Three years later, in 2013, that number was up to 35%. We are truly in a new world. What’s the good in all this change? What’s the bad? Why are so many people frustrated? But the transformation of our romantic lives can’t be explained by technology alone. In a short period of time, the whole culture of finding love has changed dramatically. A few decades ago people would find a decent person who lived in their neighborhood. Their families would meet and, after deciding neither party seemed like a murderer, they would get married and soon have a kid–all by the time they were twenty-four. Today, people marry later than ever and spend years of their lives on a quest to find the perfect person, a soul mate. For years, Aziz Ansari has been aiming his comic insight at modern romance, but for Modern Romance, the book, he decided to take things to another level. He teamed up with NYU sociologist Eric Klinenberg and designed a massive research project, including hundreds of interviews and focus groups conducted everywhere from Tokyo to Buenos Aires to Wichita. They analyzed behavioral data and surveys and created their own online research forum on Reddit, which drew thousands of messages. They enlisted the world’s leading social scientists, including Andrew Cherlin, Eli Finkel, Helen Fisher, Sheena Iyengar, Barry Schwartz, Sherry Turkle, and Robb Willer. The result is Modern Romance, a marriage of cutting-edge social science and razor-sharp humor to form an assessment of our new romantic world that is as funny as it is groundbreaking. I loved this book, but it also infuriated me. Two years ago, when I was 25, I wrote 80 pages of a pseudo-memoir about how I was 25 and had so far avoided having an actual boyfriend. Now Katie Heaney does the same thing, and SO MUCH BETTER. I’m over my jealousy – this girl is hilarious and we are kindred spirits. Her every observation (whether about 90s kid culture, junior high horror, or college friendships) is so accurate. Her personality, like mine, is perfectly suited to obsessions and inaction. Which is why she’s 25 and hasn’t had a date. “I just don’t know how anyone ever knows what to do with their bodies. I catch myself worrying about what my arms are doing when I’m walking alone, and that is just walking. Alone.